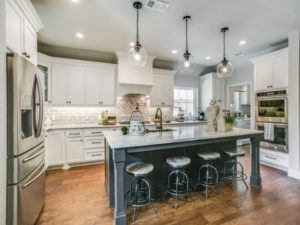 Is your home ready for 2019? Whether you want to refresh your space with a fun new twist or bring old décor up-to-date, now is a fantastic time to try something different. Bold colors, interesting textures, and unexpected uses of metal will dominate home remodeling trends in 2019, leaving plenty of room for creativity and experimentation. Are you ready to rethink your favorite space? Here are seven of the most promising and versatile design trends for the year ahead. Is your home ready for 2019? Download our free guide to this year's biggest home design trends! Crisp, all-white kitchens are on their way out, and dark, dramatic colors are making an appearance. Dark cabinetry is one of the coolest new trends in kitchen design, and its moody effect and low-maintenance appeal will last for years to come. Deep blues have more life and dimension than other pops of color, especially as lighting changes throughout the day. Choose cabinets in shadowy shades of sapphire, navy, or even teal, then contrast them with brighter fixtures and accents. Renovating your whole kitchen? Blue cabinetry is actually a striking complement to Moroccan tiles and gold or brass knobs, two other re-emerging home remodeling trends in 2019. And, if you want to capitalize on the mixed-finish look throughout the room, keep your upper cabinetry light and leave the dark blue for the bottom half of the room. Kitchen appliance trends aren’t just outgrowing stainless steel, they’re outgrowing metal altogether. Bold, bright appliance colors like red, blue, green, and yellow will continue to be designer darlings in 2019. 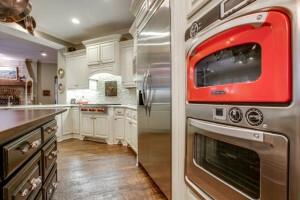 Refrigerators and oven ranges look more artistic and exclusive, drawing out the unique features of your space. The right choice will add an unexpected twist to your kitchen. Incorporating a pop of color may be the eye-catching statement piece your kitchen needs. If a special edition appliance isn’t in your home remodeling budget, you can improvise with a piece of statement furniture and a few coats of paint. For example, an oversize armoire will double as a one-of-a-kind pantry, china cabinet, or bar. Instead of trying to match its wood finish to your flooring and other surfaces, make it vibrant by painting it blue, purple, or another fun color that hasn’t shown up in your kitchen yet. You spend a lot of time using and looking into your sinks, so why not turn them into statement pieces that actually deserve your attention? 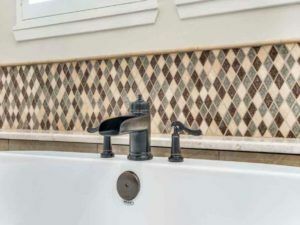 From textured farmhouse sinks to hand-hammered bowls with detailed designs, kitchen and bathroom sinks are no longer limited to certain shapes, sizes, or finishes. Unique, standout sinks are paving the way for you to express your personal style in your most functional spaces. 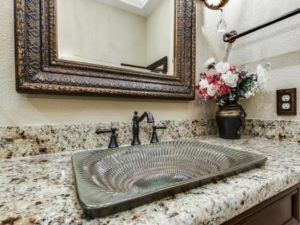 This year’s mixed-metal trend makes it easy to incorporate a statement sink into any bathroom or kitchen, regardless of your current fixture style. Think flowery, intricate mandalas circling your drain. How about textured titanium edges that simulate the shine of wet rocks under a waterfall? Or, to add some charm and sophistication, install a speckled gold bowl that recalls ancient pottery under museum lights. The possibilities are endless. Porous, high-maintenance stone countertops were never very practical. Designers are finally shying away from them in favor of the neutral, transitional and versatile look of concrete. With the right glaze and lighting, concrete countertops can resemble everything from wooden butcher blocks to polished steel. They don’t scratch, rust, or dent like other materials, making them highly functional and practical for every day use. You can also choose a matte finish and colorless stain if you prefer a more minimalist, industrial effect. Because concrete is so malleable before it hardens, it is a wise choice for countertops with waterfall edges or unusual shapes. Pouring concrete is much easier and more affordable than cutting custom slabs of granite, quartz, or even glass. This is especially beneficial if your surfaces are full of odd angles or awkwardly sized pieces. This also makes it a cost-effective choice for large, uninterrupted surfaces, like oversize islands or long buffet-style countertops. Dark cabinetry and wall paint are no longer off-limits, even in smaller kitchens and bathrooms. However, your rooms should never look smaller as a result. Take advantage of some optical illusions to “open up” these rooms without losing storage opportunities. Open shelves look more sophisticated than traditional cabinets and open up the wall space to give a more light and airy feel to the room. 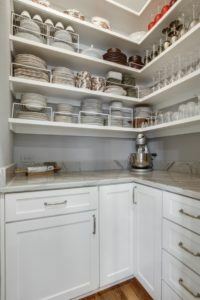 Open shelving is also more convenient and easy to organize. Cups and dishes don’t get pushed into dark corners, and you don’t have to open any doors or climb any higher to see what you have. Consider replacing your upper cabinets with open shelving during your next kitchen upgrade, especially if your lower cabinets are on the darker end of the color spectrum. You don’t have to replace every fixture with stainless steel to have a kitchen or bathroom that looks modern. In fact, this go-to décor choice is decidedly over, with more and more designers eyeing the versatility of mixed metals. Don’t be afraid to experiment with different color tones and finishes within the same room. Consider elements like pewter faucets under brass light fixtures or mix-and-match furniture with silver, copper, and bronze accents. Worried about clashing colors? One mismatched metal fixture will look out of place, but a medley of different metallic hues play well together. Think rose gold with silver, or copper with chrome. Make sure you strike a balance of contrasting cool and warm undertones rather than going all-in on one or the other. Why let rugs do all the work? If you want a more interesting floor, commit to the concept with a bold pattern or design that stretches from wall to wall. 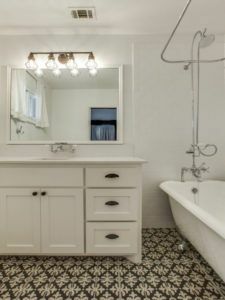 Statement flooring is a great choice for kitchens and bathrooms because tiles arranged in interesting patterns can withstand spills and foot traffic much better than a rug with the same design. You can also create unexpected patterns with hardwood or wood tile pieces. Just opt for a few different colors or finishes in the same size and arrange them at strategic angles. Whether you create a symmetrical pattern or sneak a small design into the center, your new floor will be sure to amaze your guests. Whether you choose to paint your cabinets blue or replace every fixture in your house, home remodeling is an investment. It will start paying off the moment the project is finished, creating a space for the whole family to enjoy. No matter the style, size, or budget of your project, our Design Build Team can help make sure your transformation goes smoothly. 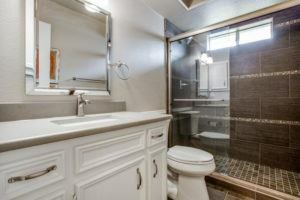 Contact us today to request a free home remodeling estimate.